I think that allowing outside classes to add listeners to buttons is good, *but*, you definitely do not want to have the listener extend ActivityTab because the listener fails the "is-a" test. One way to do this simply is to give your panel that holds the delete button a public method that allows you to add an actionlistener to it, e.g.,: how to change minecraft destination folder To add an event handler for the button, use the method addActionListener. You see we create an anonymous class as a parameter of the method. We put our code to handle event inside the method You see we create an anonymous class as a parameter of the method. 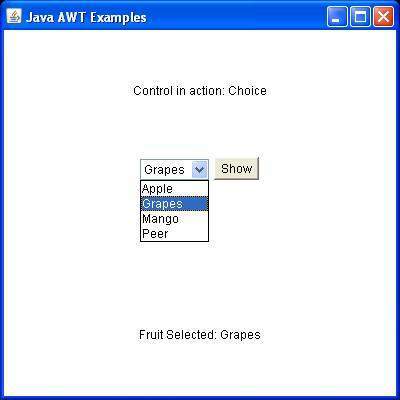 A simple Java Button Example given to understand how to create components and link to event handling mechanism. User interface (communication-point) with a running Java program can be in two ways – using keyboard input and the other with GUI. how to add people to google+ circle 25/03/2008 · Re: Multiple (button events) ActionListener Events for a Button help please 807591 Mar 24, 2008 11:52 PM ( in response to 807591 ) Ok I solved it myself here is the code! Now to make the GUI do stuff. My question is, in all of my other classes, i have already written fucntions that will be tied to buttons (ie, add user[writes to db], delete user, etc), but my question lies with how do i properly implement actionListener and ActionPerformed.